Q Park Tower Bridge, Gainsford Street, London SE1 2NY Open 24 hours, 7 days a week. Tower Bridge Parking, The Circle, Queen Elizabeth Street, London, SE1 2JE Open 24 hours, 7 days a week. 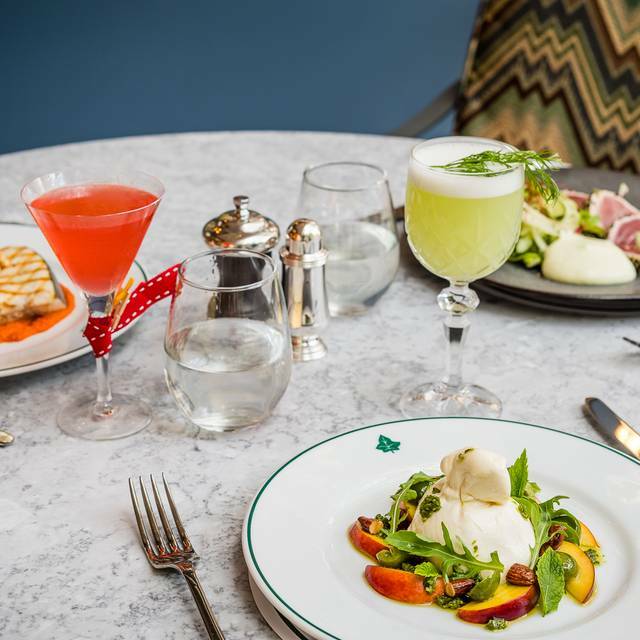 The Ivy Tower Bridge is an all-day British brasserie with an all-encompassing menu serving modern British and international Ivy-inspired classics from dawn until dusk, seven days a week. Making the most of its riverside location and views of the iconic Tower Bridge and Tower of London, the restaurant also features an outdoor terrace, a bar and a private dining room on the first floor, offering tranquil relaxed yet sophisticated dining with beautiful views across the river. With interiors designed by Martin Brudnizki Design Studio, the two-floors restaurant will offer guests the choice of dining within the restaurant, enjoying the view from floor to ceiling glass windows, or outside on the Parisian-style al fresco terrace seating 50 and overlooking the River Thames. Myself and my boyfriend visited the Ivy on Good Friday for lunch to celebrate his birthday. 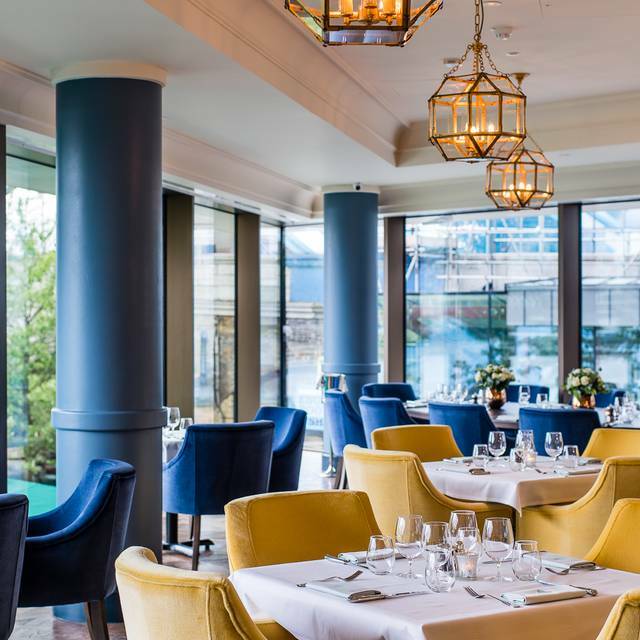 We were greeted and sat down with high expectations as The Ivy is a restaurant we often dine at however this is the first time we have visited the Tower Bridge restaurant. The only thing I cannot fault is the food as it was lovely however the service we received was horrendous. During our meal, a gentleman and his friend sat on the table behind us, I'm not sure how they were given the level of importance but as soon as they arrived, every member of staff devoted their time to him and nobody else, meaning our table along with many others were left to just wait. They were rude and only making sure one customer was satisfied. He was clearly either a customer who visits often or has links to the restaurant but paying customers like us were left with no service, and when they finally came to our table, they were rude and snappy so that they could get back to serving this one customer. As the meal ended I decided to use the bathroom and when I asked where the bathroom was, a female member of staff looked me up and down and asked me in the most rude manner "Are you even dining with us". That was unacceptable, I am a paying customer and yet I'm treated like that. We received our bill which was incorrect however had to wait for 20 minutes to deal with it because service was only on one table. The rude and judgmental staff made this trip awful for my boyfriends birthday and I am shocked that staff had no curtsy when working for a restaurant such as The Ivy. Service began extremely well until my two friends arrived then it seemed to be very slow. We had to call a waiter on three occasions. We were pre-theatre diners so needed to pace the meal. I am aware the Ivy is well staffed but we sat outside where it seemed less so. 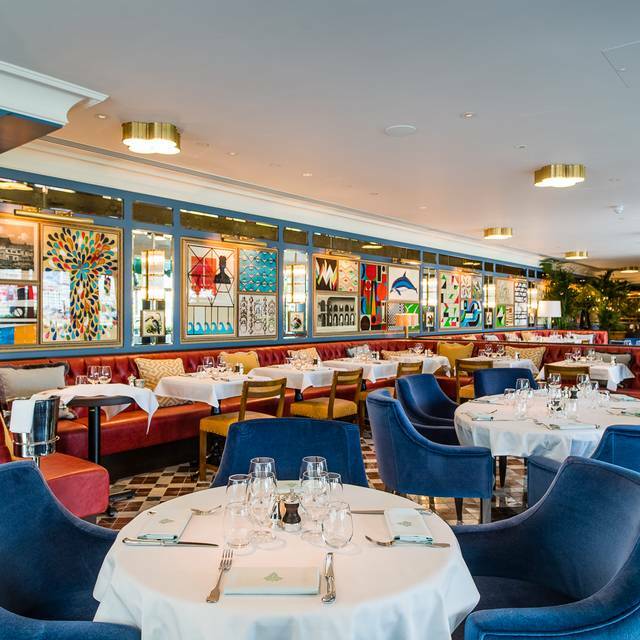 A great place to eat before or after going to the Bridge Theatre. Good food reasonably priced. Quite noisy inside because of the low ceiling. Nice on the terrace with a view of Tower Bridge. I chose The Ivy Tower Bridge for its proximity to the Bridge theatre, and was v pleased to discover it is literally next door so definitely a plus it you're seeing a show there. Staff are extremely friendly and welcoming, but the foyer is way too small with the entrance, reception, exit and left-coat service all taking place in the same small area. We were not rushed to make our dining choices, but it would have been nice to know that certain options were not available, this was not made known when given the menus, but when the wine was brought. It was only when we were ordering that we were as advised what the specials were!! The set menu seems to offer great value for money but did not appeal to any of our party, be warned you will need your glasses to read the a la carte menu! 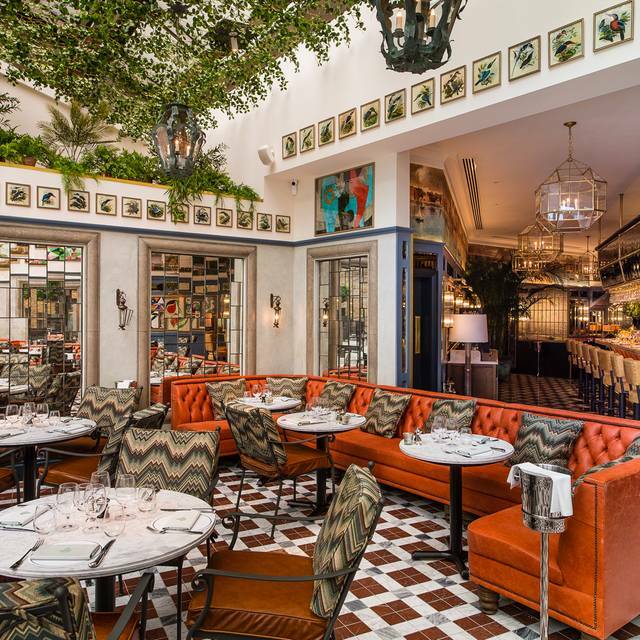 However the overall experience was positive, we were seated by a window and it felt like we were in a conservatory with the decor as it is, I would dine here again. 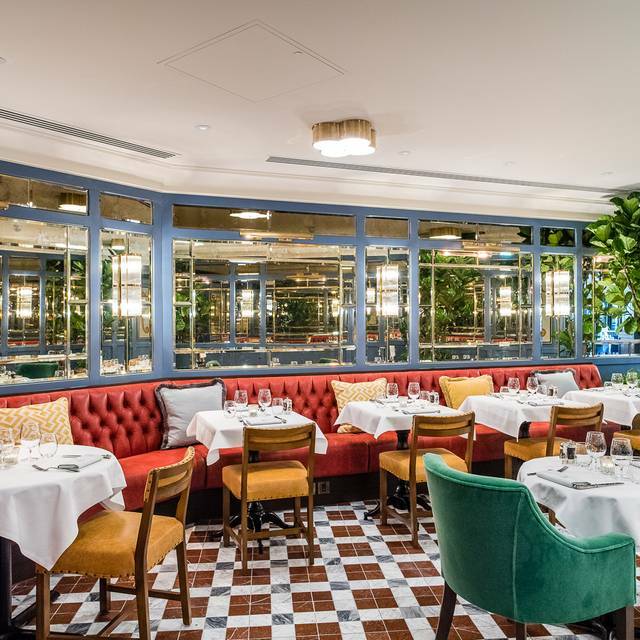 I had not been to the Ivy Tower Bridge before, but comparing it to my occasional visits to the Ivy in Covent Garden, admittedly some years ago, I felt rather let down by the evening. The staff were charming and professional, it must be said, even if the room, despite its magnificent riverside views, was we found very noisy, and initially none too warm as I was sitting next to an open door to the external eating area. But the staff, very obligingly, closed it and things improved greatly. The problem for me however was the food. Perhaps I chose unwisely, but I decided to go for my old favourite, shepherds pie, which I used always to order at Covent Garden and which I found always very special. This pie contained a mixture of lamb mince but also lamb chunks, which is something I had never previously met and which did not appeal. Additionally, the creamed spinach, also an old favourite, was stringy and also less than lukewarm. I did not mention this to our delightful Spanish waitress, who could not have been kinder regarding the open door, as a I thought she had suffered enough! My sweet, crepe brûlée, was find, and the wine too, but it was somehow not quite the evening I had expected, particularly as I had invited a very old friend along. 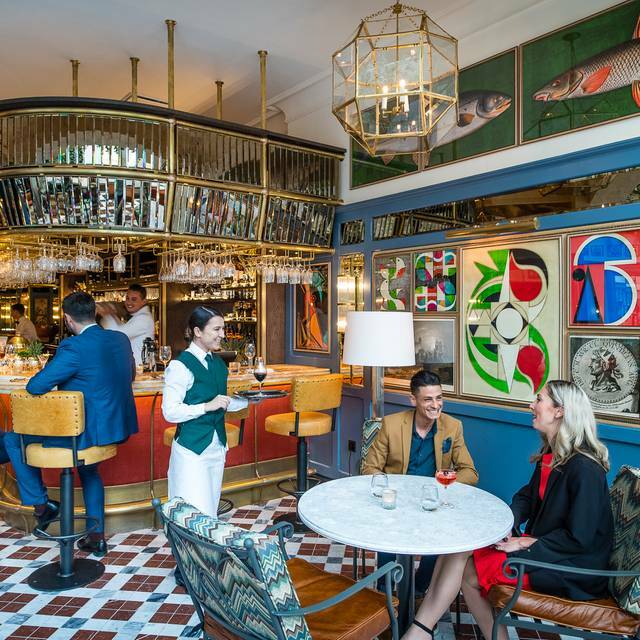 I have seen it remarked that The Ivy seems to be a franchise and that perhaps standards are not quite what they were. But I shall return! Very disappointed. Our table was not ready at the time we've booked. Instead of showing us to the bar area to wait for our table, we were directed to an inside corridor by the front office staff and just left there for 20 minutes to amuse ourselves. The front office staff were not very welcoming and barely polite. We were served by a brusque waitress that not once offered any advice on the menu or any words of welcome or even one smile. To add insult to injury, she has bumped several times into my wife's back when clearing the table and served dishes across diners. This could well be because the place was incredibly crowded with not enough space between tables. The food was of average quality and certainly not as expected for this price range. The place was very noisy. A waste of a spectacular location and a terrible dilution of "The Ivy" brand. 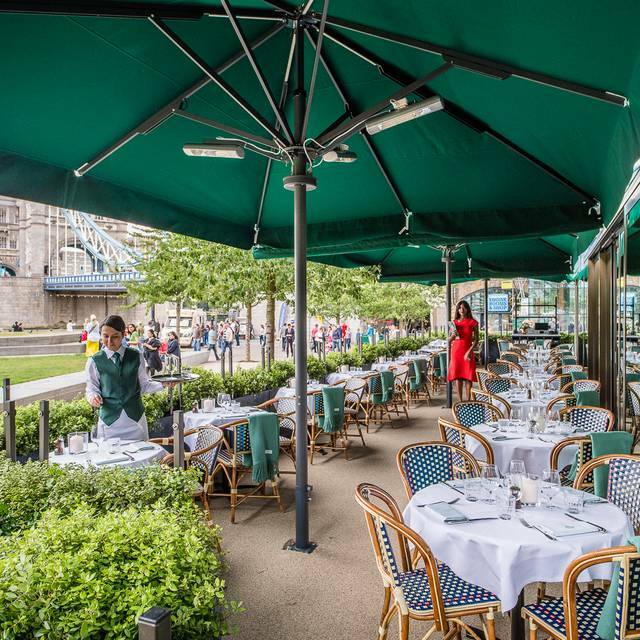 We requested riverside table and were allocated a lovely table with a display of beautiful fresh flowers and great views of Tower Bridge, very attentive and friendly staff. We went for a mixture of our party ordering from the dinner set menu, and also a la cadre. One of the tree starters, that we chose from the set menu we was informed was out. We chose an alternative mackerel late which was tasty. My rump steak was like a minute steak, cooked medium and unfortunately rather chewy and not tender, my husbands lamb pappardelle was delicious. The staff and location make this worth a visit, the food was not exceptional. The food was exceptionally disappointing. My starter was tasteless and my burger was overcooked. The temperature and taste convinced me it had been reheated in a microwave. The service was good generally with the exception of one staff member who was very rude. Unfortunately, my experience was indicative of a chain of themed restaurants. 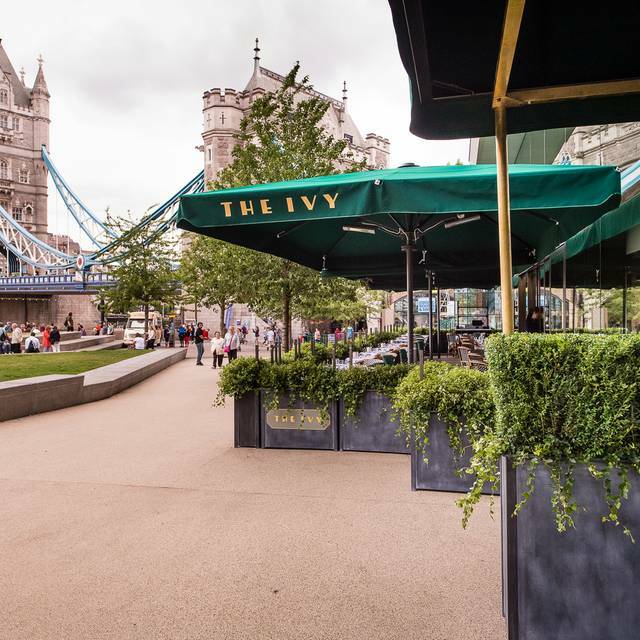 My friend and I lunched at the Ivy Tower Bridge wondering how it would be having read various comments from those who had eaten there already. It seemed to be a 'Marmite' experience! However we were thrilled with the position of our table, the staff were attentive and polite, and the food was delicious. A thoroughly enjoyable lunch. Relies too much on the fact it is an “Ivy”. Poor service. I asked for a table with a view (the view was the main reason why i picked this place) and despite of the fact that the restaurant was half-empty we were given a table without view. Worst service I’ve received in London, food was actually less than average and you’d expect a lot more from the Ivy brand. I’ll stick to the real one in future. Very noisy. Lots of staff at reception just chatting amongst themselves rather than noticing the clients. Service OK but not professional. People were very friendly though. Had afternoon tea. Some bread stale, chocolate mouse not set, average quality. Not given cutlery for meal. Lovely looking place, very busy. Let down by the quality of the food and training of staff. Better places for same price. We went to celebrate my husbands 60th birthday and although we arrived early we were taken good care of and found a place at the bar. We had a table with a view of Tower Bridge and the service was excellent. They even surprised my husband with a candle in a pastry for his birthday. Staff were friendly and food was great? as usual excellent food and service with a sensibly varied menu. Tried to get someone’s attention to order our first drinks after 10mins and the girl gave a stroppy look . Bread was ordered and we had to ask what had happened to it because we was eating our starters and still no bread. Out of the 6 main meals 4 were brought to the table and the other 2 turned up 5 mins later . It just wasn’t the best experience I’ve ever had eating out in London that’s for sure. 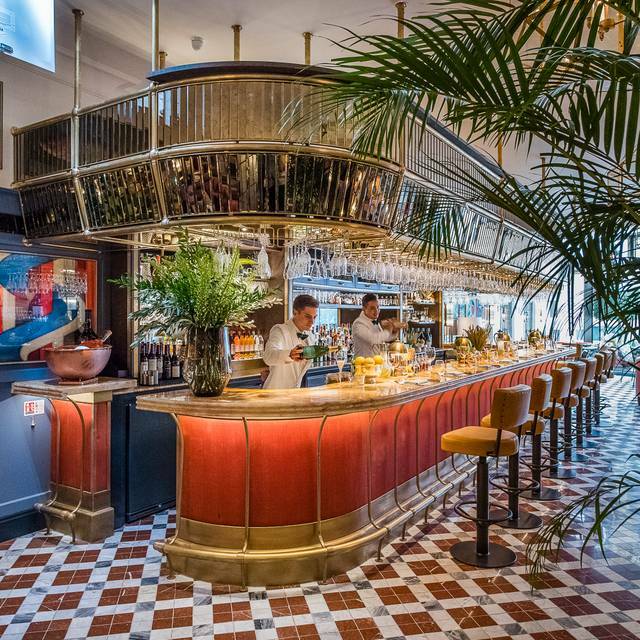 The Ivy Cafe off oxford street is so much better. Would I go back .....probably not ....no definitely not ! the food was amazing and the location and ambiance was great. The only thing that we was a bit disappointed with was the service. Our starters come before our drinks, also one of our mains come up wrong so we had to send the rest of the parties food back as we all wanted to wat together so we had to wait again for our food. Also when we tried to order another drink it took ages to get some ones attention. Also it was my mums birthday so we asked a member of staff to bring out a small cake so we could sing happy birthday, we was hoping it would come with our desserts however it did not and when we asked the member of staff they said they had forgot! which was really disappointing. the food is really great however I think there needs to be more communication between staff members and bit more attention to detail. Really enjoyed the food. The waiters were really nice especially a male waiter whom I asked if it were possible to bring a little birthday gift for one of my guests. As he promised, it was delivered during the dessert meal was being eaten and made all the difference! Excellent food, all cooked to perfection and very tasty. My only issue would be the noise level and too many table placed too close to one another which ruins the experience slightly, so maybe it would be worth taking a few tables away and placing large noisy groups further away from couples and small groups. Location is great, décor is also lovely. I would recommend and maybe go during 'non-peak' times! I invited a friend here for lunch as a belated birthday celebration and from the time we arrived to departure the experience was fantastic. Attentive staff, fabulous food, great atmosphere and view - even on a cold rainy day, we didn’t even notice as the vibe in the restaurant was buzzing with activity. The menu is lengthy with loads to choose from. Can’t rate The Ivy highly enough. Lovely restaurant lovely staff, pleasant ambience and nice food. Lovely. The waiters were amazing and we were not rushed to eat. Excellent restaurant with great food and attentive staff. Lovely setting with open windows onto the views of the Thames and London skyline. Service very good. Not too formal but polite and efficient. Had an amazing rum baba for desert. The main did not come with any veg to speak of and I did ask if I would need this, but the waiter seemed to think that I would not need it. However, the seabass was divine and it made room for dessert! Would go again - very handy if you are staying at the Tower Hotel as just a short walk across the bridge. I’ve eaten here a few times before theatre at the Bridge but not again. Overbooked and service was appalling. We were there at 6.15, ordered by just after 6.20 and had flagged we were going to the theatre but food only turned up at nearly quarter past 7, with theatre starting. at 7.30. To their credit the food was good and they did not charge for our mains. But not a pleasant experience. Meanwhile the American couple who turned up 15 minutes after us got their food 10 minutes before us. And it was so poor that they returned it. Unfortunately the food is only ok but the prices are high. It is not really a restaurant more a café with great decor. The food does not live up to it's prices or surroundings which is a shame as location wise it is wonderful for views of Tower Bridge and The Tower of London also very convenient for Bridge Theatre. Better to grab a snack at the Bridge Theatre or at least their freshly baked madeleines! I would recommend The Ivy London Bridge to someone only if they don’t mind waiting a long time for service. We went for a pre theatre dinner. The service at 5:45 was terribly terribly slow. We waited an hour for our main course. The dining room was no where near full. I would not want to eat there when it is crowded, goodness only knows how long the service would take! Great location. Window table for 2. Lovely waiting staff but prone to doing disappearing acts. Disappointing welcome.